A group of students connected to the International Children’s Outreach (ICO), which is founded by Guyanese born Onica Charles, has been in Guyana and working hard over the past few weeks. ICO is an organization registered in the United States, which caters for children in various parts of the world including the founder’s homeland, Guyana, along with Jamaica, South Africa and others. The outreaches are executed by students from universities in the USA who give up their usually fun and party-filled summer and spring breaks to volunteer in third world countries. 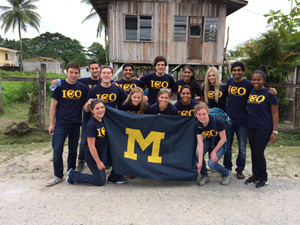 Recently, a contingent of thirteen students from the University of Michigan who recently returned home, stayed in Craig, East Bank Demerara to work on various community projects. The students are freshmen, sophomore and juniors aspiring to be doctors in America. They came to Guyana during their spring break through a club on their campus called the American Medical Students Association (AMSA). The club promoted community service and outreach. Its members are mostly pre-medical students. During their first visit here, the students undertook a beautification project at the Diamond Diagnostic Centre. In addition to working all night on that project, ICO also gave a number of medical supplies to the Hospital, all of which were donated by individuals from the United States. The group also volunteered at St. Ann’s Girls Orphanage in Georgetown where they refurbished 42 of the girl’s cupboards for them to store their personal items. “It’s a really simple project but it makes the girls happy. They all even love the new colour…it is all that matters,” said Laura Kruger, one of the volunteers. While some of the children were having fun with their toys, another set was helping the students of Michigan University prepare dinner. Unlike the usual feeding programmes, the students actually prepared a scrumptious spaghetti dinner from scratch, right at the orphanage, with the help of the girls from the home. But surely, making that dish was not as fun as making cupcakes. On the third day of service, the students visited Craig Nursery School where they worked alongside the teachers in the classrooms, spearheading story time and playing with the children out in the fields. Before classes were dismissed, the volunteers provided the children free hotdogs, ice cream and juice. ICO also donated over 100 new storybooks to the nursery school. “The storybooks at the school were a bit outdated, so it was nice to give new books for the teachers to read to children,” Charles explained. According to the volunteers, the most rewarding experience here has been the playing and interacting with the children. Additionally, the helpers walked around the village of Craig and handed out parcels of food, clothing, toys, and hygiene products, which were also donated to ICO by US residents. Also, the ICO volunteers worked on laying the foundation for the ICO community center, which, upon completion, will be free and accessible by all. Charles explained that the center will be equipped with a computer lab, where the children will have access to the Internet to do research for school; a kitchen, which will provide a free hot lunch to children daily; and a food pantry where individuals will be able to get free food supplies to those who can’t afford to buy groceries for their families. For students like Avani Patel and Emily Chianrian, this project was the most valuable. “It is nice to know that the work we did will benefit a lot of people in the village,” Chinarian said. “It was fun to experience manual labour and give some of the workers a break,” Patel added. The community center is expected to be ready by next year. Charles told this publication that it is usually a pleasure bringing students to her homeland, especially since Guyanese have been able to benefit a great deal. She noted that Brian Chase, a resident of Craig, also donated two truckloads of sand to help with the project. In recognizing that it takes a village to raise a child, Charles said that she has high aspirations that this center will bring the community closer, adding that the togetherness is much needed to ensure the overall development of the children. Charles will be bringing another group of students from the University of California at the end of March.